Automation manufacturer RTI, which is represented locally by Connected Media Australia, will be releasing its VXU-SC video conferencing system at the Integrated Systems Europe (ISE) 2019 conference in February. The VXU-SC video conferencing system allows for multiple users to interact easily with software-based conferencing solutions such as Microsoft Skype, Cisco WebEx and Citrix GoToMeetings. In addition to support for video content from a wide range of devices, USB sharing also enables control from any connected PC, laptop and interactive display, and allows inexpensive webcams and microphones to be used. Additional commercial solutions to be launched will include the VMS-741 multiviewer, which features seven video inputs, 4K video output and can be configured for viewing up to four sources simultaneously on one display. “Last year at ISE we introduced a line of AV products to give dealers a comprehensive, end-to-end solution for automating commercial environments,” says RTI chief executive Ed McConaghay. The RTI Miravue VIP-1 video-over-IP transceiver acts as a transmitter and receiver in one versatile device. Dramatically reducing cabling and installation time, the system enables powerful, scalable AV distribution over both wired and wireless Ethernet networking. In addition, network video streams from IP cameras may be viewed without the need for additional equipment. 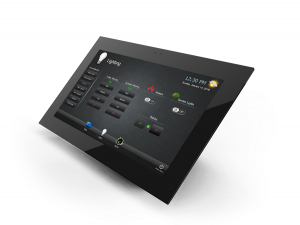 Handheld interfaces on display will include RTI’s T4x flagship remote control, which is perfectly suited for any contemporary environment. Its sleek, sophisticated design offers superb ergonomics, a high-resolution 4-inch capacitive touchscreen, and fully programmable soft-touch buttons. The T4x sets the standard in wireless control with advanced features, including grip sensors, Wi-Fi, dual RF and more. Highlighted touchpanel controllers will include the KA8 and KA11, which feature fully customizable 8-inch or 11.6-inch widescreen high-resolution LCD displays with integrated capacitive touchscreens. The sleek devices are easily wall-mounted or can be used with an accessory stand for tabletop installation. Ambient light sensors automatically adjust the screen brightness, while built-in Ethernet with PoE powers the unit. RTI continues to put the focus on enhancing the dealer experience with new software and training initiatives. The RTiQ cloud-based solution intelligently monitors RTI control system components and other electronic systems. Dealers are notified via email and text notifications if a failure occurs so they can perform actions remotely to correct the situation — eliminating the need for service calls to address simple issues and reducing system downtime. Additionally, the new RTIXCEL training programs are designed to provide dealers with a variety of training options to accommodate their busy schedules — anyway, anytime, anywhere. RTIXCEL Online, the new state-of-the-art online learning management system, allows dealers to learn more effectively and at their own pace, while the schedule of on-site training events and webinars hosted by RTI dealer experience managers is also expanded worldwide.